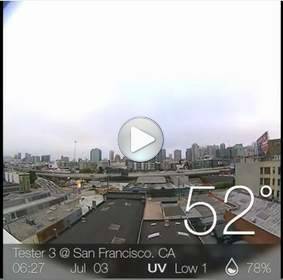 SAN FRANCISCO, CA--(Marketwired - Jul 15, 2014) - BloomSky, developer of the world's first personal smart weather station, today announced the launch of beta testing for its new outdoor module, which is equipped with a high definition (HD) camera, and can record the meteorological conditions in a particular local area. The beta site will encompass the entire city of San Francisco, a metropolis well-known for its challenging terrain and microclimates. BloomSky is a combination of personal hardware and a mobile network that lets consumers access community-based, media-rich weather data from a network of mobile-enabled devices. The BloomSky "hyperlocal" weather station lets users share real-time weather data and sky images via crowdsourcing. Meteorologists and weather sites currently aggregate data and make generalized predictions across a very wide area. However, this presents problems in cities like San Francisco, where one metropolitan sector may have totally different weather conditions than another, at the same time. The San Francisco beta test will evaluate the accuracy of BloomSky data at the neighborhood level, by showing what is actually happening weather-wise in a particular area, versus what was forecast. The BloomSky generated output will be compared to other public weather information, side-by-side, during the entire event. "As part of the process, we would also like to examine how participants interact with the real-time data; how they share the information with their friends; and how they react to it emotionally," said J.T. Xiao, BloomSky CEO and Founder. "We also chose San Francisco for the beta test, in part, because we are based in the Bay Area and can easily monitor ongoing activities and provide support." In San Francisco, BloomSky will test up to 80 modules over a ten-week period through the end of October. The company will also distribute more than 200 mobile apps that can access the weather information from anywhere in the world. BloomSky will recruit weather "reporters," based on a strategic plan that reflects the variety of climate patterns, topography and population density areas in the city. These "meteorologists" may include San Francisco residents, small businesses such as mom-and-pop stores or bed-and-breakfast outlets, and public sector organizations such as parks and recreation departments or public schools. To take part in the San Francisco BloomSky weather station beta test, apply at http://www.bloomsky.com/beta-test by August 15, 2014. The complete BloomSky weather station, which consists of both indoor and outdoor modules, is capable of measuring temperature, humidity, barometric pressure, UV exposure, and precipitation. The external module features a 170 degree, ultra-wide angle camera that takes picture of the sky every three to five minutes and, at sunset, automatically creates a time-lapse video of the day's weather events. The BloomSky package also includes a companion smart phone app (Apple iOS or Android) that lets users remotely access data collected from the outdoor and indoor modules located at their own home or place of business. The app displays each individual's personal local weather information on the phone, along with a real-time snapshot of the sky. 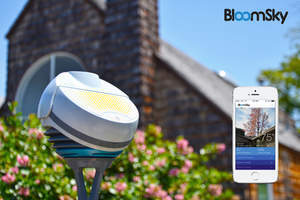 The BloomSky weather station is powered by atmospheric sensors that are smart enough to tell whenever the weather in a neighborhood changes and automatically send an update to the user's smartphone. Purchasers can even use BloomSky to post their own weather photos to their Facebook page and Twitter feed, or share them on Instagram. BloomSky hardware devices can be inserted into the ground or mounted on a railing, wall or rooftop. The outdoor module is designed to perform under harsh weather conditions and is resistant to water, dust and sunlight. It is wireless and powered by rechargeable battery or solar panel. The cost of the BloomSky outdoor module with the ground stake mount is $169. The indoor module and solar panel will both retail for $39 each. A wall mounting kit is available for an additional $9. The mobile app is free and accessible to anyone. BloomSky aims to bring weather into the digital age by changing the way meteorological data is collected and shared. The company plans to release its first version of the BloomSky personal weather station product in December of this year, with an Apple iOS app. The Android version should be available in early 2015. BloomSky is a trademark of BloomSky, Inc. All other trademarks and brands are the property of their respective owners.